The unbeatable combination of chocolate and peanut butter makes these bite-sized desserts irresistible. Whisk the peanut butter and vanilla together in a medium bowl. Gradually add the powdered sugar stirring with a spatula until completely incorporated. Knead the peanut butter mixture with your hands until the powdered sugar is completely incorporated and the mixture is smooth and glossy. Place the peanut butter mixture in the refrigerator for at least 1 hour to chill (optional; a firmer peanut butter mixture is easier to mold into a ball). Place the chocolate and coconut oil in a small deep bowl and melt in a microwave oven at 50% power, using increments of 30 seconds to avoid overheating the chocolate. Once the ingredients have melted, stir well to combine. 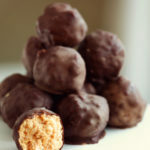 Remove one peanut butter ball at a time from the freezer (you want them to remain as cold as possible before dipping) and dip in the chocolate mixture. Using two forks, turn the peanut butter ball to coat in chocolate, then shake off any excess chocolate and place on a parchment paper-lined baking sheet. Repeat with remaining peanut butter balls.